I don’t give this advice often, but if I were you, I wouldn’t do anything this week. I’d stay in every night, make sure to get plenty of rest, and maybe even try to eat a little healthier than usual. Think of it as the calm before the storm: Come next Friday, this town will be on fire. Friday, Nov. 5 marks the start of the 10-day extravaganza that is San Diego Beer Week. 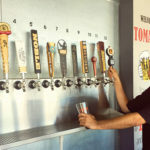 For one week and two weekends, every beer-friendly bar and restaurant in the county will be promoting special events centered on two things: San Diego and craft beer. It’s pretty amazing. And truth be told, a little overwhelming. Unless, that is, you have a strategy. 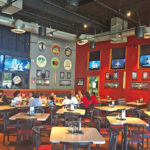 If you can get away with it, start beer week early with lunch at Blind Lady Ale House, which will open early to showcase beers from Lee Chase’s in-house nano-brewery, Atomic Brewing Co. It’s a pretty unique opportunity to sample the brewery’s growing lineup, especially during the lunch hour. After work, hit up the Linkery for a pre-dinner drink to finally allow yourself to decide whether you like cask or draft beer better. The restaurant’s five-cask system will mirror’s the bars taps for a rare opportunity to taste-test between these two beer serving styles. Stay for dinner at the Linkery or head up or down the road to Sea Rocket or Ritual Tavern, both of which will feature beer-themed menus. If you’re going to leave the neighborhood this week, today’s the day to do it. The flagship event of the week is the Brewers Guild Festival, held from 2 to 6 p.m. at Liberty Station in Point Loma. Tickets are $35 and include 10 tasters of beer—there will also be plenty of live music and food. If you’d rather stay in the ‘hood, let your palate travel. Head to El Take it Easy after 6 p.m. for a Baja-inspired evening of food and beer pairings featuring an array of Cucapa beers, small plates food pairings, and a soundtrack of Mexi-pop. If you’ve ever wanted to hone your homebrew skills, today’s your day: there is not one, but two homebrew classes scheduled. The more unique of the two is a free class at Sea Rocket Bistro led by Kelsey McNair, the homebrewer who recently teamed with Stone Brewing Co. and Ballast Point to release his San Diego Session beer. More traditional is an advanced all-grain class at Ballast Point’s Homebrew Mart in Linda Vista—be sure to sign up early, as space is limited to 15 people. Both classes start at noon and run for several hours. I’d be remiss to not mention the Liars Club Redux at Eleven this evening, although I selfishly hesitated to include it. I have a not-so-secret fondness for the now-closed Liars Club, and could talk your ear off about their BLTA sandwiches on jalapeño cheese bread if I had the space. The evening will feature a Liars-Club inspired menu, beers that were standards at the Mission Beach bar, and a soundtrack reminiscent of the bar’s outstanding jukebox. It’s one of my top events of the week (hopefully it won’t be too crowded). This is the day to dig deep into barrels and Belgians. The Linkery promises to have some special beers dug up from their cellars, Eleven will have Chimay’s lineup during happy hour, and Hamiltons and Small Bar will feature several Avery barrel-aged beers (and will run a free shuttle bus between the two bars). If you haven’t had a chance to see Beer Wars yet, head over to Sea Rocket Bistro and enjoy their three-course beer prix fixe menu during the movie. Bonus for homebrewers: there’s no corkage fee on any homebrew you bring in. Take a break from the bars and spend tonight appeasing the foodie in you. South Park Abbey will be serving a four-course beer dinner featuring beer from the Bruery. The $48 prix-fixe menu includes Rugbrod-roasted butternut squash bisque, Saison Rue braised short ribs, and Autumn Maple pumpkin tart. Or head to Ritual Tavern for an Alesmith beer-pairing dinner with Alesmith brewer Bill Batten, featuring Old Numbskull, Horny Devil, Wee Heavy, and Speedway Stout. Frisbee Golfers unite! 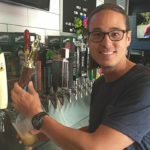 This is the day for Hamilton’s second-annual Beer Week frolf tournament in the morning, followed by a Green Flash celebration at the pub starting at 3 p.m. (workday, what workday?). The tourney is open to those who pre-register only, and includes a shirt, disc, breakfast, and post-game beer and BBQ at Morley Field. At the pub, expect Green Flash favorites as well as rarer treats, including SuperFreak, Citra Session, and Hamilton’s 4th Anniversary Roasted Pumpkin Ale. Wednesday also happens to be the monthly DrinkAbout, which means you can catch a free shuttle to eight local craft beer establishments, most which are not only offering specials but special releases. To check shuttle times, visit drinkabout.com. If you missed DrinkAbout, today offers a second chance to progress through the bars and restaurants of North Park. Five restaurants, including Ritual Tavern and Sea Rocket, will be participating in a Green Flash progressive dinner, featuring beers from Green Flash paired with small plates. If you’d rather stay put in one location, Sea Rocket will have a trivia night starting at 6:30 p.m. There is a plethora of good beer around town today. Find Green Flash’s sour and barrel-aged beers at Blind Lady Ale House, Airdale pints at South Park Abbey, Avery beers at Ritual Tavern, Ballast Point’s lagers at the Linkery, and a broad range of Dogfish Head beers (including quite a few rarer ones) at Hamiltons. If you want a souvenir from Beer Week, Sea Rocket is featuring a BottleHood keep-the-glass night. BottleHood makes glasses and vases from upcycled beer and wine bottles, and Sea Rocket is offering $3 refills once you buy a glass. Friday night wouldn’t be complete without a little music, and tonight you can find your favorite brewers out of their element. Head to Eleven for the debut of The Yeasty Boys, a beer-loving band composed of brewers from Stone, Pizza Port, Green Flash, plus Brewers Guild President Adam Carbonell and a few bartenders from around town. If you’re enamored with beer after a week of craft beer-tasting, now is your chance to make some. Ballast Point will feature a beginning brewers class from 1 to 3 p.m. for $10. Register early, though, as space is limited. 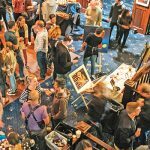 Beer Week happens to coincide with Hamiltons Second Saturday event, which this month features beers from Marin Brewing Co. Arrive early for a space, complimentary food, and beer specials. If you aren’t up for the Second Saturday crowds, both the Linkery and Ritual Tavern will host brewery dinners with out-of-town brewers, with Mad River at the Linkery and Ommegang at Ritual. Pack the most into the last day of Beer Week by heading out early. 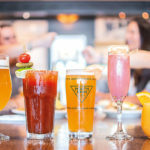 Try brunch at Small Bar with Coronado Brewing Co. beers, or at Hamiltons Tavern with Huyghe Brewery. Transition to lunchtime at Counterpoint, for a barbeque with the Linkery featuring music by Swim Party, or at Eleven, for barbeque fare and music by the Firkins. Then, of course, there’s the culmination of Beer Week: The Brewers Guild Beer Garden at the Lodge at Torrey Pines. The event features food and beer pairings with some of the area’s most talented chefs, each of whom partners with an area brewer to create a dish to pair with a particular beer. The $65 entry ticket will get you all you can eat and drink. The events scheduled for beer week will continue to unfold as the week gets closer. 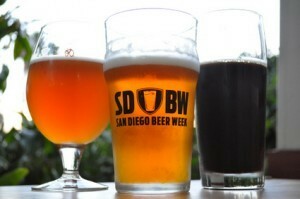 To make sure you don’t miss anything—and for details of the events listed here—be sure to check the event listing at SDBW.org. 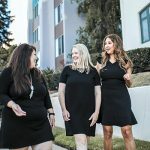 And don’t forget to look outside the uptown neighborhoods—there’s more going on in Encinitas, Kearny Mesa, and the beaches than this column has space. Other than that, I’ve got no other advice than to head out, explore the beer community, and seek out beers you haven’t yet had a chance to appreciate.